Insomnia / Sleeplessness is a disorder which makes it very hard to sleep. Some reasons for this disorder could be stress, anxiety, depression, some kind of medications, nicotine, changes in your work environment etc. It can have a great impact on your life by lowering energy levels, changing your mood and the performance of your work will be reduced. There is also the increased risk and severity of long term diseases (high blood pressure, heart problems, diabetes etc). According to National Sleep Foundation (NSF), every adult have to sleep for at least seven to eight hours to be in healthy state. There are many homemade natural remedies which help you to get rid of this problem. Milk contains tryptophan which helps to promote sleep. Mix 1/4 teaspoon of cinnamon powder in a cup of warm water. Drink it one hour before going to bed. Mix a glass of milk with one teaspoon of honey. Drink this before going to sleep. This works as tonic and natural tranquillizer to get rid of insomnia. Chamomile acts as a sleeping aid as it contains the compound apigenin which has sedative effect. Boil a cup of water and add a teaspoon of chamomile herb. Let it cover and steep for 15 minutes. Add a pinch of cinnamon and a little bit of honey as per the taste. Aniseed relaxes the nervous system which and promotes good sleep. Combine 375ml of water with a teaspoon of aniseed. Strain the mixture and add honey and milk to it before drinking. Drink daily before going to sleep. Valerian is a herb that has a sedative and muscle relaxing effect. Add an equal quantity (1/2 teaspoon) of grated valerian root and nutmeg to two cups of hot water and steep it for about 15 minutes. Drink this occasionally to get rid of the insomnia. Add a teaspoon of valerian herb in a cup of water. Stir it well and steep it for few minutes. Strain it to drink the tea. Dilute half a teaspoon of valerian tincture in a glass of water. Have this water twice a day. Apple cider vinegar contains amino acids which help to get relief from fatigue. ACV helps to breakdown fatty acids that release tryptophan which also helps to get natural sleep. Honey helps to raise insulin level and releases serotonin which regulates the sleep cycles. Mix two teaspoons each of organic apple cider vinegar and honey in a glass of warm water. Drink this before you go to sleep. Mix two teaspoons of apple cider vinegar in a cup of honey. Eat a teaspoon of this syrup every night with or without water. Nutmeg contains sedative property which helps to get natural sleep. Mix one-eighth teaspoon of nutmeg powder in a cup of warm milk. Drink this while going to bed. Mix it well and drink before bed. Mix a pinch of nutmeg powder in a teaspoon of Indian gooseberry juice. Consume this three times a day to treat indigestion and depression problems. Cumin seeds has a tranquilizing effect which helps to cure the insomnia. Mash a ripe banana and mix with a teaspoon of cumin powder. Eat this before going to bed. Heat a teaspoon of cumin seeds for about 5 seconds. Add one cup of water and boil. Turn off the heat and cover for 5-7 minutes. Strain it and drink before going to bed. Almonds contain tryptophan as well as magnesium that help to relax your muscles. Eat handful of almonds throughout the day. Eat regularly to get good sleep. Honey promotes relaxation and helps to ease your tummy at night. It contains natural sugar which raises the insulin level and allows tryptophan which will make you sleepy. Mix two teaspoons of honey into a glass of water. Drink this after eating dinner. Or you can simply take a spoonful of honey before going to bed. Banana contains tryptophan, melatonin, serotonin and magnesium which acts as muscle relaxant and helps you sleep well. Eat a banana before going to bed. Oats are rich in melatonin, a sleep-inviting hormone to get sleep naturally. Eat oatmeal by adding 2 tablespoons of flaxseeds night time regularly. Saffron has mild sedative properties which help in getting natural sleep. Steep 2-3 strands of saffron in a cup of warm milk. Fenugreek acts as sleeping aid which helps to get natural sleep and prevent insomnia. Combine 2 teaspoons of fresh fenugreek juice and one teaspoon of honey. Consume it daily before going to bed. Green tea contains L-theanine, an amino acid which helps to combat anxiety that interferes with sleep. It helps to reduce the stress levels and helps you relax. Have green tea five hours before going to bed. Drinking this green tea regularly helps to get regular and natural sleep. Lavender acts as a mild sedative and helps you to fall asleep faster. Apply lavender oil, lotions or bath salts on your body regularly. You can also use other flavours which help you sleep. This is known as aromatherapy. Music makes you relaxed which helps you to get better sleep. Listen to your favourite music about 45 minutes before going to bed. Slow music such as classical will work best. Acupuncture also helps to get rid of insomnia. Putting thin needles in your skin at specific points on your body can help you to sleep. Make sure that this process is done by an experienced practitioner. Sleep in dark, quiet, comfortable and cool room. Limit your caffeine and don’t take afternoon. A regular sleeping pattern helps to get natural sleep. Listening to bedtime stories will make you sleepy. White noise machines are designed to help you sleep by producing low level soothing noise. Change your pillow position in the way which helps you to get better sleep. Have a warm bath two hours before bed time which will relax your body. For additional benefits, add 2 cups of Epsom salt. Finish your dinner 3 hours before going to bed. Have sugary food 30 minutes before bedtime which will acts as a sedative. You can also take honey by adding it in herbal tea. Eat bedtime snacks which have high carbohydrates, low protein such as toast, oatmeal with milk or walnuts or yogurt will helps to ease your tummy. If you wake frequently to urinate then avoid liquids for a few hours before going to bed. Have a sleep journal to record what makes you to sleep or not. Melatonin is a hormone which regulates your biological clock. Take the supplement of melatonin to get better sleep under the advice of a doctor. Eat food that contains magnesium and calcium as both of these are sleep boosters. Stay away from smart phones, iPods, laptops or other gadgets to get a perfect sleep as the blue wavelength produced by your phone will suppress the production of melatonin. Yoga can relieve many health problems which will make you sleep better. If you’re pregnant, check out our post on natural remedies for insomnia during pregnancy. Try to avoid taking naps during daytime. Check your medications as some medicines like Beta-blockers cause insomnia. Go to you prescribed doctor and discuss this. Do 30 minutes of aerobic exercise 4 -5 hours before bed. Write down an action plan for your worries so you don’t think about them at night. Indulge yourself in some reading from health blogs to learn more about treating insomnia. 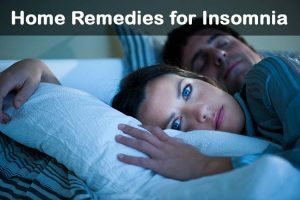 These remedies are very effective in treating acute insomnia as well as chronic insomnia problem. Different remedies works well for different people, so try these remedies to get nice sleep every night. If you didn’t observe any change in your sleeping problem, then consult doctor to get the diagnosis. Are you feeling sleepy whole day? Not able to sleep during night? Having trouble staying awake during meetings? Nodding yes to the above questions? Don’t worry you are not alone. Several people are suffering with this problem. But it’s time to take some action or else your health may be at risk. Good and sound sleep is often referred as one of the cornerstones of health. When we say good sleep, it is not quantity that matters but it’s the quality. Sleep is a mysterious shift in consciousness where your body and brain gets relaxed to prepare for the next day’s challenges and struggles. A disturbed sleep has adverse effects on not just your next day’s performance but also it’s the health that’s on the stake. Worried? Take an initiative today of having a quality sleep and you can get relived from health disorders quickly. The quality of sleep is often measured by sleep-wake cycle. In a sleep-wake cycle, there are two different stages – slow wave sleep, REM sleep. Slow Wave sleep – During this phase, the body completely relaxes, blood pressure falls and brain becomes less responsive. This phase is very essential for repair and renewal of the body. The pituitary gland release growth hormone during this phase which ensures to stimulate tissue growth and repair. It also repairs the weak immune system. REM sleep – During this phase brain dreams, clears out irrelevant information, re-organizes information, boosts memory, and improves neural and learning growth. Slow wave cycle helps to recover physically whereas REM sleep helps to recover mentally. A good sound sleep ensures these two cycles are completed. Follow Consistent Schedule – Following a consistent sleep-wake schedule helps your body to re-organize its clock and improve the quality of sleep. Avoid sleeping extra hours during weekends and holidays. If you have trouble sleeping during nights, avoid taking naps during the day. Don’t fall asleep right after having dinner. Take at least 2 hours gap before going to bed after having dinner. Establish a sleep inducing environment in your bedroom – Creating a sleep environment ensures a sleep without interruptions. Your bedroom should be moderately cool, free from noise and very low in light. Ensure your mattress and pillows are comfortable. Consider using room-darkening shades, ear plugs and eye masks to sleep better. Lighten up dinner – Eating heavy meals or drinking too much before sleeping can make you uncomfortable and decrease the quality of sleeping. Avoid drinking, smoking, caffeine consumption improves sleep quality. Be cautious of spicy foods and foods that are difficult to digest. A gap of 2 hours between and sleep is recommended by many doctors. Exercise regularly – Exercising regularly helps your body release toxins, maintain weight and improve sleep quality. Never exercise before going to bed. If you are working out at the evening, try to finish it 4 hours before going to bed. Make up a sleeping routine – A bedtime relaxing routine helps your body to separate sleep time from daily activities. Try to read a book or listen to music that induces sleep in you. Don’t do stimulating activities like working, reading adventurous or mystery books, listening to rock or rap music and others that disturb your sleep. Taking hot shower also helps to get proper sleep. Apart from the tips we have also come up with some home remedies you can try to get proper sleep. These methods help your body relax and improve sleep quality. Massaging helps the nerves to relax and improve blood circulation which induce sleep. Take a small amount of warm coconut oil or mustard oil. Rub it on your neck, shoulders, feet and back. Continue massaging for 5 to 10 minutes. Massage regularly before going to bed. The magnesium sulfate present in Epsom salt soothes the sore muscles and nerves which in turn encourage sound sleep. Add 1 1/2 cup of Epsom salt to warm bath water. Soak yourself for 20 minutes. Or you can add few drops of lavender oil in warm water and soak yourself for 20 minutes. Or mix few drops of lavender oil in 1 tablespoon olive oil and rub it on the bottom of each foot before going to bed. Repeat any of the spa remedies 3 times a week an hour before going to bed. Mix 2 tablespoons of dried chamomile tea in a cup of hot water. Let it steep for 5 minutes and strain it. Add 1 tablespoon honey and a pinch of cinnamon to the tea. Have the tea warm. Let valerian root steep in hot water and few minutes. Strain it, add honey and consume it. Mix 1 teaspoon dried lemon balm in 1 cup of hot water. After 10 minutes strain it to drink. Add 2 teaspoons of dried catnip to hot water. After 10 minutes, strain it, add honey and consume warm. Consume any tea 1 hour before going to bed. Drink regularly to improve the sleep quality. Jasmine flowers reduce stress, strain and improve quality of sleep. Place few jasmine flowers near your bed or pillow to induce sleep. Sprinkle camphor powder inside your bedroom. This helps to bring deep and undisturbed sleep. Lavender oil not only increases the quality of sleep but also helps people feel refreshed in the morning. Put 1 or 2 drops of essential oil in a cloth or handkerchief and place it near your pillow. Drink 1 glass of warm milk 1 hour before going to bed. For better results, mix 1 ¼ teaspoon cinnamon powder and 1/2 teaspoon honey to a warm glass of milk. Drink it daily 1 hour before going to bed. Consume 1 cup of tart cherry juice daily 2 times. If you don’t like the taste of the juice, then eat a handful of cherries 2 hours before going to bed. Eat banana 1 hour before going to bed. Or consume a banana milk shake an hour before going to bed. Choose any of the home remedies and avail its maximum benefits by following regularly. As we have already mentioned to exercise regularly, here we are presenting few yoga postures that improve sleep quality. Include them in your regular workout routine. Hastapadasana or Forward Bend – This asana or yoga posture helps to stretch the back muscles, revitalizes nervous system and increases blood circulation. Marjariasana or Cat Stretch – This yoga posture increases spine flexibility, massages digestive organs, improves digestion and relaxes mind. Shishuasana or Child Pose – This yoga posture helps to deeply stretch the back which helps to relax the nervous system so that you can sleep in peace. Baddha Konasana or Butterfly Pose – This yoga posture removes the fatigue caused due to standing or walking for long hours. Viparita Karani or Legs-up-the-wall Pose – This is an excellent yoga posture to relieve the stress, tired legs, mild headache and increase blood supply. It actually depends on the sleep debt and age of the person. But generally, for adults it is 7 – 9 hours, for teenagers it is 8 – 10 hours, school kids it is 10 – 11 hours and babies it more these. Sleeping for more or less hours both can damage your health. If you are sleeping less or more than what is required then concentrate on what needs to be done to adjust. Record your daily sleep timings, issues that disturbing your sleep and others in a dairy to observe your sleeping pattern. This helps to evaluate the problem and find out the perfect solution for it. Despite of following the above tips and methods, if you are still facing trouble to sleep then you have to visit a doctor for proper treatment. If you have any other tips that work to induce proper sleep then share it with us. If you have any queries, write your feedback to us. Did you try any other remedies for insomnia? Do not forget to share with us. What lowers the high blood pressure every day?